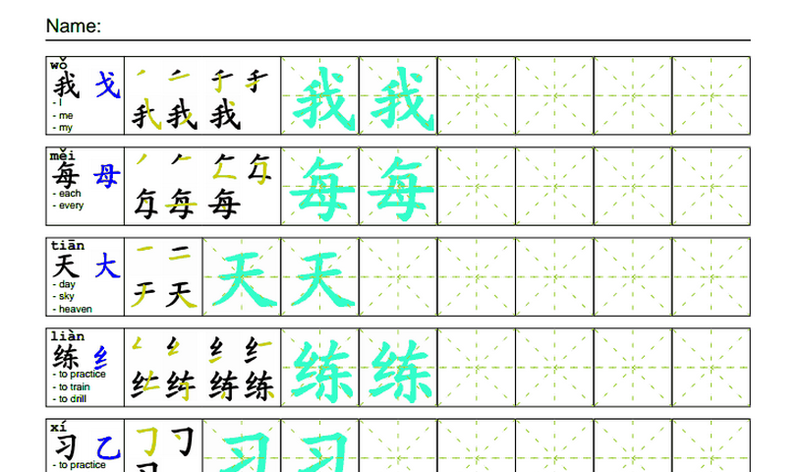 Arch Chinese is one resource that we found when we looked for ways to teach our kids Chinese. It's not one that we chose to end up using for reasons we'll discuss shortly, but we think it's a great resource nonetheless. We definitely wanted to blog about it in case it seems right for anyone else. You basically just put in the characters you want to appear on the worksheet, and it makes one for you that you can save as a PDF. You have a little bit of ability to modify the settings of the worksheet, but try as we might we couldn't figure out how to make the boxes bigger. Here is another example of the type of worksheet you can make. You can also make flashcards, and there's online testing features and stroke order animations and sound files that sound out the words. However, the fact that we couldn't seem to make the practice boxes bigger meant that it would be way too small for little kids. For older kids or even adults, though, it's clear that this would be a great resource. We believe that younger children need pictures and bigger spaces to write. Otherwise, they will probably get bored and frustrated and start to hate the idea that we're making them do the worksheets. Might be a doable option for parents that have older children around ages 10+ and are able to strictly force their children to plow through worksheet after worksheet. For many tiger moms out there, this is doable and Arch Chinese might just be a good resource for you!